“Cowboy” claims he was wrapping up his UFC 137 interviews at “The Ultimate Fighter” gym when he saw buddy Leonard Garcia joking with Diaz and he decided to join the fun. Unfortunately for Cerrone, the laughter came to a screeching halt upon his arrival. Although the battle lines were instantly drawn, Cerrone had bigger fish to fry at the time with a pivotal scrap against Dennis Siver just days away. However, after collecting his fourth victory of 2011, Cerrone immediately turned his attention to Mr. 209. Fast-forward two months and the lightweights were back at the scene of the crime, where Diaz denied any such confrontation ever took place. 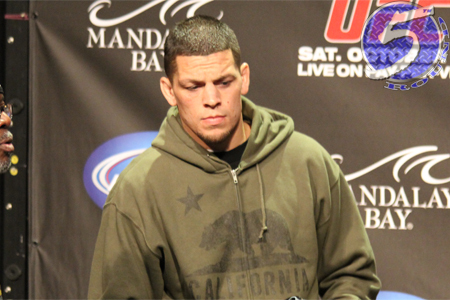 “Nothing [happened],” Diaz flatly stated during Tuesday’s media workouts. “He made it up, trying to make me a bully. I walk the other way when I see him, he’s in the same division as me. As in most cases, there’s two sides to every story with the truth lying somewhere in the middle. At the same time, Leonard Garcia could probably clear the air rather quickly. Nevertheless, the bitter rivals will have the opportunity to settle their differences this Friday at UFC 141.